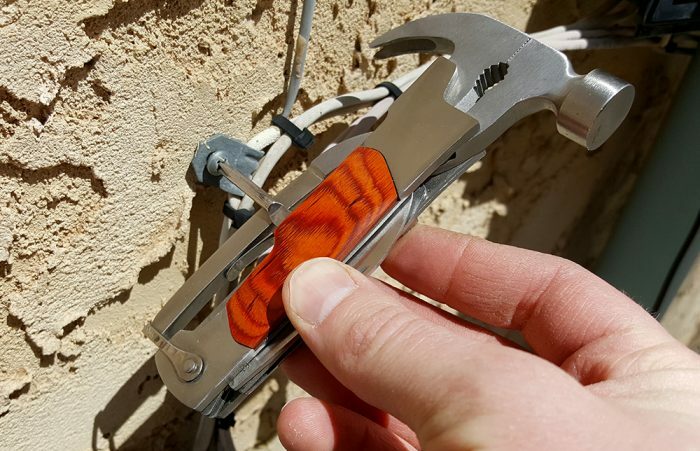 The Sheffield Hammer 14-In-1 Multi-Tool offers a lot of gadgetry in a modest package. But is it trail worthy or a cheap gimmick? Budget tools are some of the least appreciated items in the gear world. Whether you’re low on funds during a camping trip or wading into a messy project, sometimes you just need to get the job done without breaking the bank. 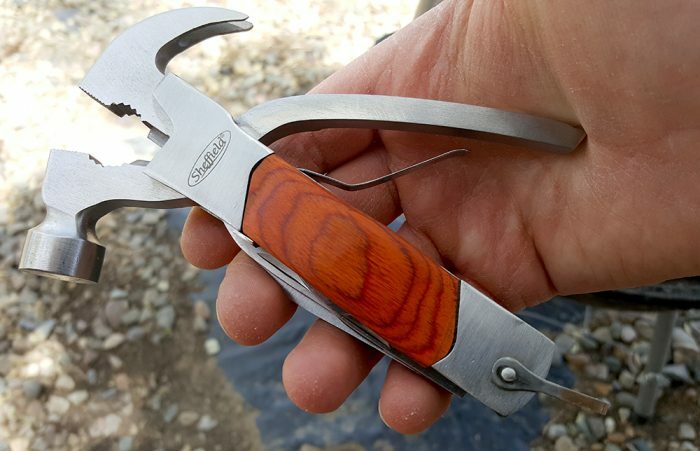 The Sheffield Hammer 14-in-1 (about $13) is a curious multi-tool aimed squarely at the weekend user. With its low entry price and wide availability, it was only a matter of time before I picked one up for testing. 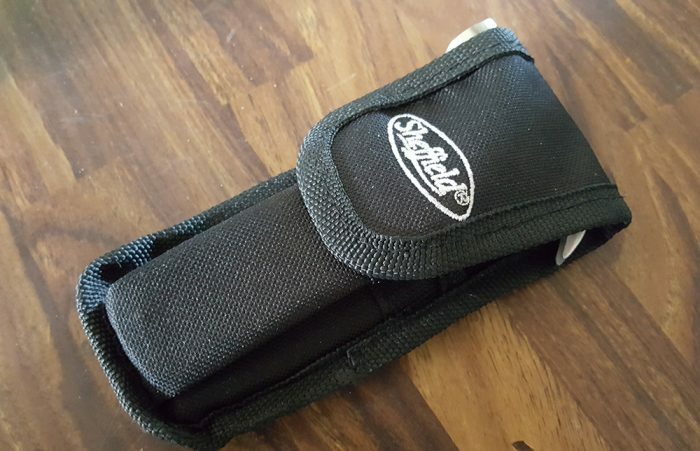 In theory, the Sheffield 14-in-1 makes a compelling case for its place in your car, kit, or hardware drawer. It has a nice variety of tools, stainless steel construction, and attractive wooden handle accents. And at 11 ounces, it’s got enough weight to drive nails without throwing out your shoulder. Add in the drivers, blades, and wire tools, and you’ve got yourself an attractive all-around package. 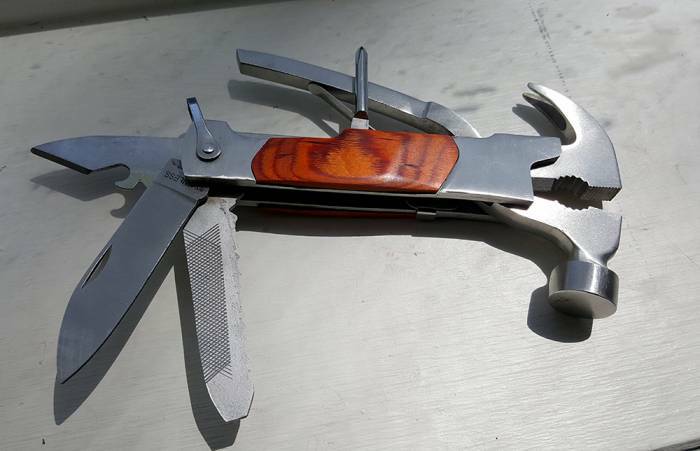 I spent several days testing this odd hammer multi-tool. Here’s what I found. Considering its heft and oddball shape, the Sheffield 14-in-1 carries reasonably well. It proved unobtrusive on a four-hour trek in Colorado’s Hermosa Creek region, riding securely in its nylon belt sheath. Watch out for the hammer claws, though. The sheath offers little lateral protection, leaving the sharp tines exposed to skin, clothing, or other items in your pack. The 2-inch saw blade proved to be a pleasant surprise. I was able to cut through several small twigs with little difficulty. Again, watch out for those claws, they tend to dig into the meat of your hand during anything resembling vigorous use. As for the plain blade… Well, we’ll talk about that later. On the home front, there are a few things the Sheffield does reasonably well. First, its hammer function lives up to the name. Driving a nail into a standard 2×4 was a relatively painless process, though the lock loop tends to come undone during the process. The hammer claws proved to be just as capable at pulling nails as they are of tugging flesh, so that’s a positive. The file on the aforementioned saw blade also fits the bill, with enough tooth for light to medium duty applications. Let’s hit briefly (and, shall we say, cordially) on some of the other tools. The wire strippers will strip wire, and the three screwdrivers will drive screws. 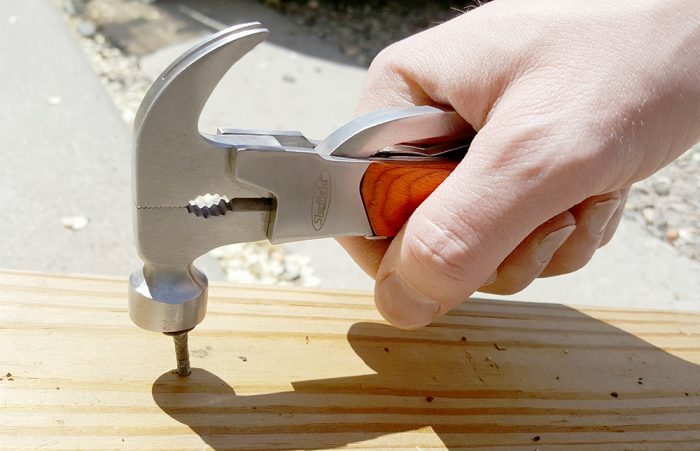 The dual-use pliers will pinch, and the wire cutters will cut. There’s also a can opener, an oft-overlooked item for both camping and emergency preparedness. Ready for the rest of the story? Hang on, it gets rough. Like a man with a broken rib, the Sheffield Hammer can do nothing comfortably. This is, without question, the least ergonomic multi-tool I’ve ever used. It has more sharp surfaces than a cactus, though none of them are where they’re supposed to be. 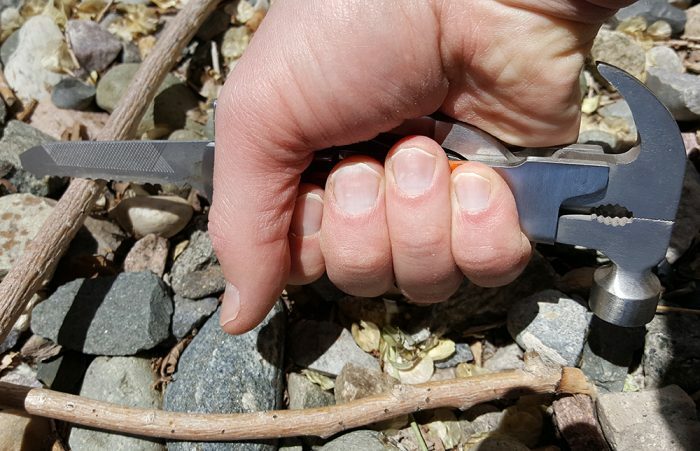 Case in point, the 14-in-1’s drop-point blade: It would not cut, sharpen, hold an edge, or perform any of the functions usually associated with a knife; at least not in my testing, which included a Lansky Blade Medic, a Spyderco Sharp Maker, multiple twigs, and several sheets of mutilated printer paper. I didn’t come into this test expecting a razor edge, but I did expect something that could peel bark. Then there are the screwdrivers. The Philips and 1/8-inch slotted drivers deploy at a 90-degree angle to the body of the tool, making them very difficult to use. And the lone in-line driver, the 1/4-inch at the tip of the saw, is too thick for any screw you’d reasonably expect to find in the Sheffield’s wheelhouse. Those keeping track will notice that we’ve only discussed thirteen of the Sheffield’s titular “14-in-1” tool claim. Curious about the last one? According to every product description I could find, the last tool is a key ring. Stop laughing, I’m serious. This appears to be the same piece of metal that loops over the thin pliers handle. Keep in mind that this is already an 11-ounce tool that rides in a sheath. What possible use could there be for adding keys, except to make the lock loop pop off more easily? Sheffield has long been known as a maker of budget tools. And some of its more traditional pliers-based offerings are actually decent options for cost-conscious, light-use buyers. But like its main blade on a piece of cardboard, the Hammer 14-in-1 just can’t cut it. Those who really need a multi-tool should look elsewhere, like these great multi-tools.